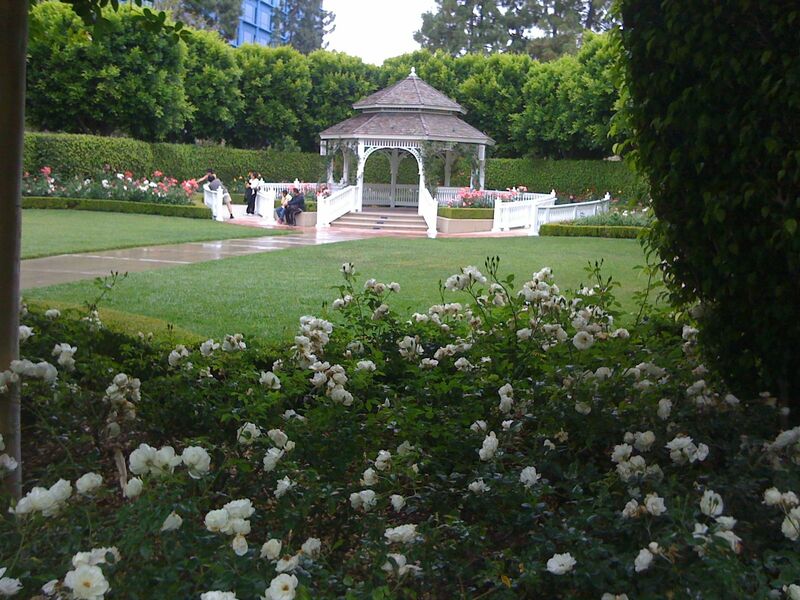 Ah, the Rose Court Garden at The Disneyland Hotel. It holds a special place in my heart because it was my ceremony venue. 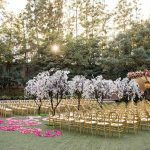 I would wager that the Rose Court Garden is the most popular venue for wedding ceremonies, which is good because it was built way back in the late 1990s for the express purpose of hosting weddings. It’s a beautiful, mostly secluded little spot. The focal point is a large gazebo, surrounded by over 800 rose bushes that are in bloom the majority of the year thanks to California’s mild climate. But don’t fret if you’re getting married in the middle of winter; the space will still be green and lush! I often tell potential Disneyland brides and grooms that the Rose Court Garden is the ideal venue because you don’t need any extra decor! But if you want to decorate the Rose Court Garden gazebo, Disney’s floral team can help bring your vision to life. 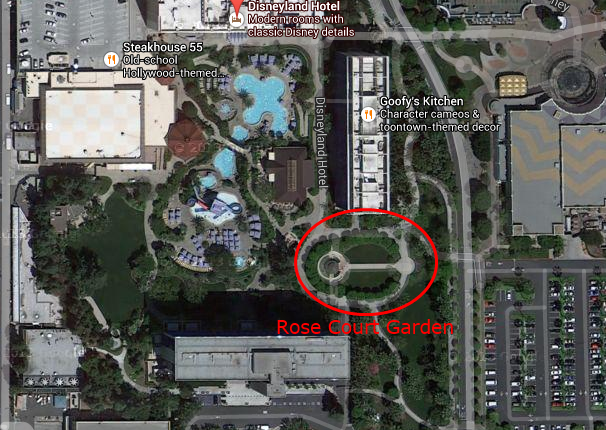 Location: The Rose Court Garden is located on the east side of The Disneyland Hotel grounds, between the Frontier Tower and Adventure Tower. To the west of the Rose Court Garden is the pool area and to the east is the self-parking lot for Disney’s Grand Californian Hotel and the Paradise Pier Hotel. 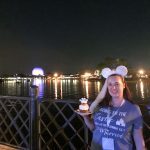 Here is a video showing how you get from the bridal “getting ready” room (typically the Safari Room in the Adventure Tower) to the Rose Court Garden. Q. 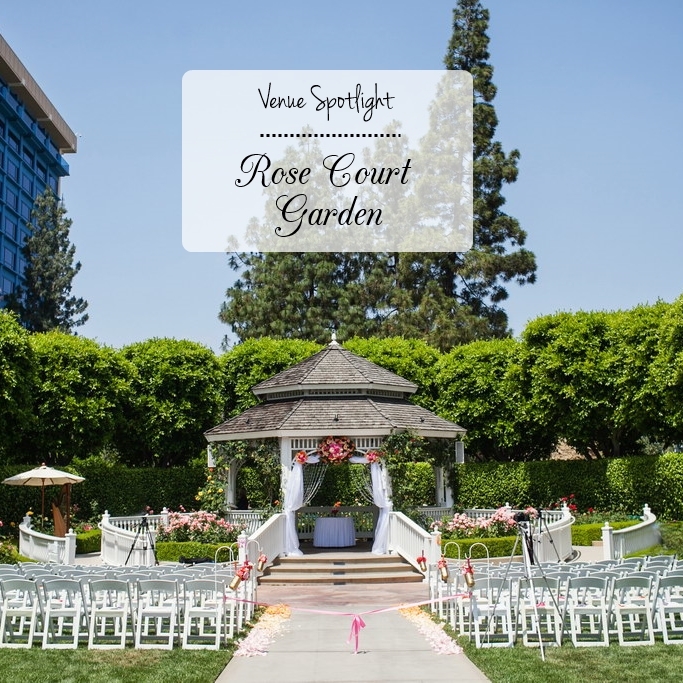 Is the Rose Court Garden available as a ceremony option for Escape weddings? A. No, the Rose Court Garden is only an option for Wishes wedding packages. Q. Are there certain times your ceremony can be held? A. Yes, Disney offers the following ceremony times: 9:30am and 11:30am for lunch receptions and 5pm or 7:30pm for dinner receptions. Q. How do they set up the chairs? How many rows and how many chairs deep? A. The answer to this depends on your guest count. Disney will arrange the chairs so everything looks even. If you’re having a smaller wedding, the rows may only be 5 or 6 chairs deep. If you’re having a larger wedding, the rows could be 10 or 12 chairs deep. For our ceremony with approximately 60 guests, we had 10 rows (5 rows on each side of the aisle) with 8 chairs each. They will always put out more chairs than you are expected to need, so you don’t have to worry about guests fighting over chairs or being forced to sit next to someone they don’t like. There is always plenty of room. Q. Can you have a DJ play the music for your wedding ceremony? Where do they set up? A. Yes, you can have a DJ! This is a very popular option for ceremony music. The DJ will generally set up to the left of the gazebo on the little landing area. Please note that unless you hire a DJ through Disney, there is a “plug in” electrical fee of around $120. Q. How much time does it take for the wedding party / attendants to walk down the aisle? A. This answer really depends on how many people you have walking out before the bride (assuming it’s a traditional processional). If you’re trying to time music, I would plan for a full minute for each person or group of people who are walking out but people tend to rush (no matter how many times you tell them at rehearsal to walk slow!) so plan for that as well. Now, most bridesmaid/groomsmen pairings don’t walk alone; the next pair is usually about 20 seconds behind them. 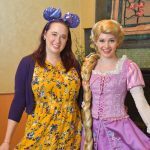 Your Disney Day-of Coordinator will help with the timing. Two tips in this situation. 1) Utilize the rehearsal to time the walks and plan the music. 2) Hire a professional musician or DJ who can control the music. A friend in charge of an iPod does not have the same experience that a professional wedding vendor has, so do this at your own risk. Q. How long does it take to walk from the carriage drop off at the Rose Court Garden to the gazebo? A. This is a tough question to give a precise answer because you don’t think about how long it takes you to get yourself together and out of the carriage, to straighten out your dress, and everyone walks at a different pace, etc. But the general consensus among past brides is to allow 90 seconds from the time you exit the carriage until you get to the end of the aisle. Q. I would like to bring in my own aisle runner. 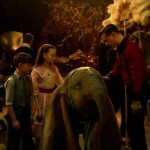 How long does it need to be? A. My notes show that the entire length of the aisle at the Rose Court Garden is around 65 feet. But your aisle runner doesn’t need to go the entire length. Usually I see it start at the bottom of the stairs and it goes just halfway up the aisle. I recommend asking your planner for a definitive answer. Also confirm with your planner regarding what you can use to adhere it to the ground. Obviously anything that leaves a mark will not be allowed. Q. What is the width of the aisle? A. The width of the aisle is 8 feet. Q. We are hiring an outside florist for our decor. What is the width and height of the center and two side arches of the gazebo? How far apart are the rows of chairs? A. I have not measured it myself, but I have been told the center arch of the gazebo is 79″ wide. The average spacing between the back of one chair to the back of the chair in the next row is 43″. The chairs stand 30″ from the ground to the top of the chair back. For the rest of the measurements you would need to check with your planner! If someone has additional measurements for these items, please leave them in the comments and I’ll add them into the post. Q. Can you have your reception at the Rose Court Garden? A. It is typically not offered as a reception venue, but I have seen it done once or twice! I featured the wedding of Sarah and Terrance and they had both their ceremony and reception at the Rose Court Garden. I believe it depends on what other events are happening that day and if the weather is nice. You can always ask your Disney planner if this could be an option for you. Q. What can you “toss” at the Rose Court Garden? I heard that traditional rice is not allowed. A. True, your guests cannot toss rice as the happy couple makes their way back up the aisle after the ceremony because rice is a hazard to birds. I’ve seen guests toss rose petals, blow bubbles, or wave ribbon wands. Disney can also offer “bubble cannons” which shoot out a stream of pretty bubbles from either side of the gazebo. 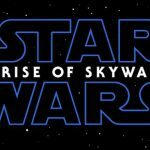 Similarly, Disney may also be able to offer confetti cannons that shoot out confetti after you are pronounced as married, although I have heard that Disney may have stopped offering confetti all together because of the massive clean up involved. If you have any other ideas, just ask your planner and they can tell you a definitive yes or no. Q. 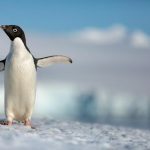 Does the officiant need a microphone? What about when you’re saying your vows, will your guests be able to hear you? A. 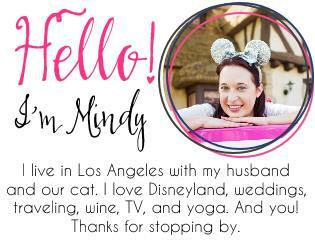 Your officiant should be mic’d and Disney will provide a mic for them. There will also be a mic stand there for when you’re saying your vows. This is included in the ceremony venue fees. Q. Speaking of ceremony venue fees, is there a fee for the Rose Court Garden? A. Yes, as of the time this post was published, the venue fee for Rose Court Garden was $2,200. This counts towards the overall minimum expenditure you must meet for your event. Q. Where do our wedding guests park for a Rose Court Garden wedding? A. Your guests’ parking lot will always coincide with your reception location, irregardless of your ceremony location. 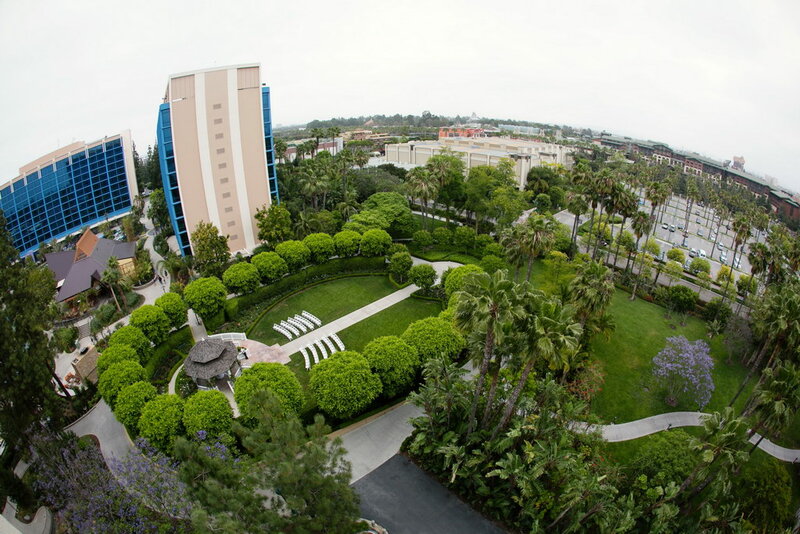 So if your reception is taking place at The Disneyland Hotel, your guests will park in The Disneyland Hotel parking lot. If your reception is taking place as Disney’s Grand Californian Hotel, your guests will park at the Disney’s Grand Californian Hotel parking lot (self-parking just happens to be adjacent to the Rose Court Garden). I hope this answers some questions you might have about having your wedding ceremony at the Rose Court Garden. If you have additional questions, please leave a comment and I will try my best to answer!